Ever since Volkswagen was caught cheating on federal emissions tests, the brand has been feeling the hurt, as consumers lost faith in the brand, and legal fees and fines put a strain on the automaker’s pocketbook. So VW is making big changes, with Reuters quoting head of VW’s passenger car brand Herbert Diess as saying that the Volkswagen brand is about to get overhauled. Part of that overhaul hopes to increase operating margins, with Volkswagen plans to cut 30,000 jobs worldwide in exchange for a promise of no forced layoffs until 2025. Around 23,000 of those jobs will be cut from Germany and the rest from Brazil, North America, Argentina and other countries. Most of these cuts will occur via buyouts, early retirement and reduction of part-time workers. The turnaround plan announced on Friday will lead to 3.7 billion euros ($3.9 billion) in annual efficiency gains and lift the VW brand’s operating margin to 4 percent by 2020, from an expected 2 percent this year. These job cuts, VW hopes, will allow the company to shift focus on electrification, with Reuters saying VW plans to add 9,000 new jobs in that field, most of them in Germany. Magna Steyr is a large Tier 1 automotive supplier that’s also well-known for assembling the Mercedes G-Wagon at the supplier’s plant in Graz, Austria since the ‘70s. A lesser known fact is that Magna also built the first-generation BMW X3 there, as well as the current Mini Countryman, and that the company plans to assembly BMW’s new 5 Series in Graz starting next year. But now, joining the Countryman, G-Wagon and 5 Series, will be the Jaguar I-Pace, as this week Jaguar Land Rover CEO Ralf Speth confirmed to Automotive News that it will be building its electric crossover, as well as another unspecified vehicle. Between the Mini, Mercedes, BMW, and these two vehicles from Jaguar Land Rover, Magna says the assembly plant in Graz expects to be pumping out 200,000 vehicles per year by 2018. That’s about as many vehicles as Jeep cranks out from its Wrangler plant in Toledo. Automakers are worried that China might repeal a tax cut, which could lead to “the first annual decline in sales on record for the world’s largest auto market,” Reuters reports. Sales taxes in China are renowned for being high, and can make owning a car prohibitively expensive. But last year, the nation cut taxes for cars with engines smaller than 1.6-liters in half, from 10 to five percent. There is a question of what will happen with this purchase tax policy. If it really comes totally to an end, then maybe the first quarter will be a little bit more difficult. 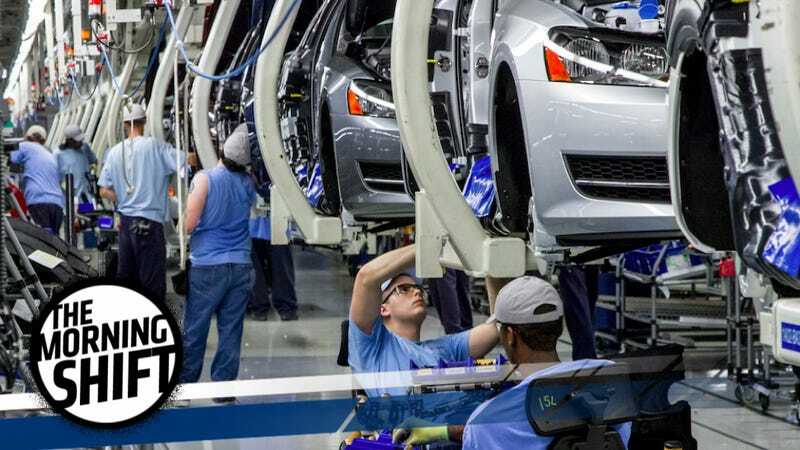 Without an extension, analysts forecast annual sales would at best be flat or could decline 2 to 3 percent, which would be the first drop since China’s car industry association began collating data in 1997. Analysts told the news site that an increase in real estate pricing has made China’s tax break unnecessary, as the auto industry won’t be needed to keep the economy afloat. Other analysts say keeping the break could just delay an inevitable sales drop. Either way, automakers are scared. Well, some of them. At Automobility LA, the Press and Trade show preceding the LA Auto Show, CEO of Mercedes-Benz Dietmar Exler told the LA Times that the biggest hindrance to self-driving vehicles becoming a reality isn’t the technology, liability concerns, or even customer acceptance. In particular, he thinks people will “bully” autonomous cars, which will be programmed to be polite and law-abiding. Exler does say autonomous cars could be calibrated to be more aggressive, but he thinks regulations will prevent that. 5th Gear: The Grand Tour Debuted On Amazon Last Night! Neutral: Will You Take Advantage Of Autonomous Cars? Would you look for an autonomous car to cut in front of? Or do you not care, as long as you can cut in front of somebody?